The Jot from Adonit is a great stylus. Fresh out of the gate Adonit are still making good with their Kickstarter backer’s orders before attending to normal buyers. I’ve heard a couple skeptical opinions on the clear disc and agree that at first it is a little odd. When you think of a pen, you think of a point or something as close to that as possible. This design is far from it- or is it? As a working, professional (whatever that really means) storyboard and concept artist, the thing I’m looking for, ideally, is a mobile Cintiq. I want to know that I can work at the airport, on a set, in a tree, on a train, in my bed, on the pot… With a Cintiq from Wacom you can do some pretty amazing work but you can’t just pick it up and take it with you. Until now, I’ve been using various, normal stubby, rubber-tipped capacitive styluses with my iPad. Honestly, I haven’t been drawing or painting on it much at all in that I’ve been working so much but when I have, it’s really been sort of a faking my way with it. It’s not to easy or fun to do any kind of precision work with what boils down to a dull crayon. Enter the Adonit Jot stylus. Now, let me show you two photographs. I took these at work while on my lunch break. On the left is a Wacom pen on a Cintiq. On the right is the Adonit Jot on the iPad. If you think about the Jot as not having a disc as a tip but rather a small, metal tip- then the disc just becomes the brush cursor. 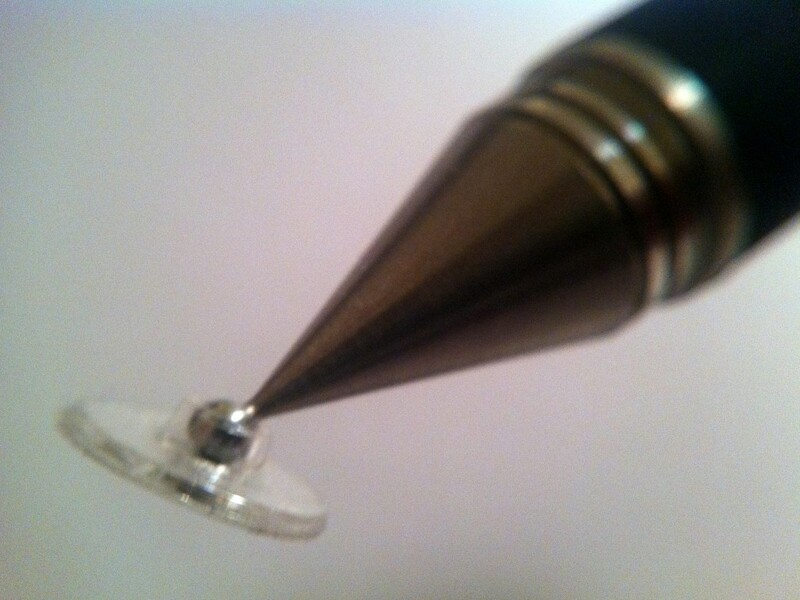 It’s a fine tip stylus with a brush cursor built around the tip. Read the full review of the Adonit Jot.